Have you ever met a real vagabond? Trips are great! I just love it. These make you encounter with very interesting people , that otherwise you would have never met. I already mentioned a few here on the blog, and here come another one. Eric, Is an Israeli, he is 62. Try to ask Eric where his home is and he will say: "nowhere" ,and he really means that! 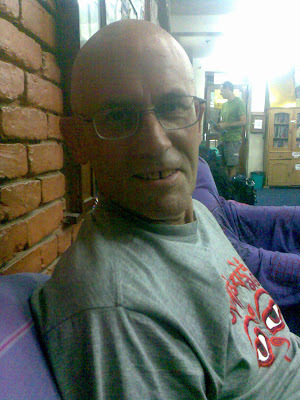 Eric is originally from Israel but I met him randomly here in the Thamel in Kathmandu. His card says he is a traveler and a photographer. He has been traveling for 5 years already with some very short brakes in Israel. He spent all those 5 years in the far east( around 15th time in Nepal already). I had a chat with him about his life and where he is about to go next. He is thinking of going to south America for a few years and then go to Africa. Since I've been to both places already I recommended him to go 1st to Africa and then go to south America. When being to Ethiopia I've seen more things which are changing and disappearing , so it's much more urgent to go there, the sooner the better. South America is amazing but can wait for a while. He said he will consider that. I was happy I can contribute from my experience even to the experienced ones! Eric, hope to meet you on some distance places in the future again.